2010 was the first year for Ironman St. George. In riding and running the course beforehand, I knew that this course was going to be a hard one on race day. Having finished the 2010 race in 13:06, I can tell you it is a tough, tough course. 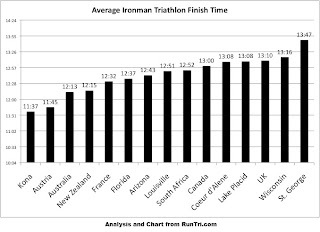 As a matter of fact, an analysis by TriHive proves it out — when compared with other Ironman courses, Ironman St. George has once of the highest average finish times. You can read my race reports and my pre-race rides HERE, but I wanted to consolidate all my thoughts into just a couple of posts. In this post, I am going to give a basic preview of each of the three sections of the course. In subsequent posts I am going to discuss in detail the swim, bike, and run courses. The swim is conducted at Sand Hollow Reservoir. I have done a ton of tri’s and this is an almost ideal location for a swim. You start out heading east, but the start of the race is early enough that you never look into the sun while you are sighting. Once you make it out far enough, you turn to the north. While the turn buoy that will have you headed into the boat ramp is a long, long ways away, you swim to the right of the island in the middle of the lake. That means it is easy to sight because you are looking for a large island that has a big hill on it. Once you pass the island you turn left and head into the finish of the swim. The finish is on a boat ramp and there is a huge inflatable archway at the ramp so sighting again is no problem. In my post specific to the swim, I will discuss what equipment I suggest you bring on the swim so you can avoid the hypothermia that plagued many of the swimmers. That water is cold people. I will cover this in more detail later, but I will give you a tip — sit down on the carpet outside of the Men’s Change Tent, right before you head in. As long as you aren’t planning on getting bare naked, this will save you a ton of time. Ah the bike. 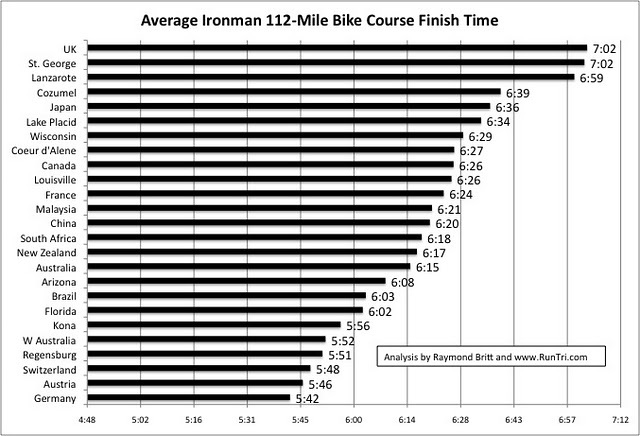 Ironman St. George has one of the toughest bike courses out there. The great thing is the facts prove this out. 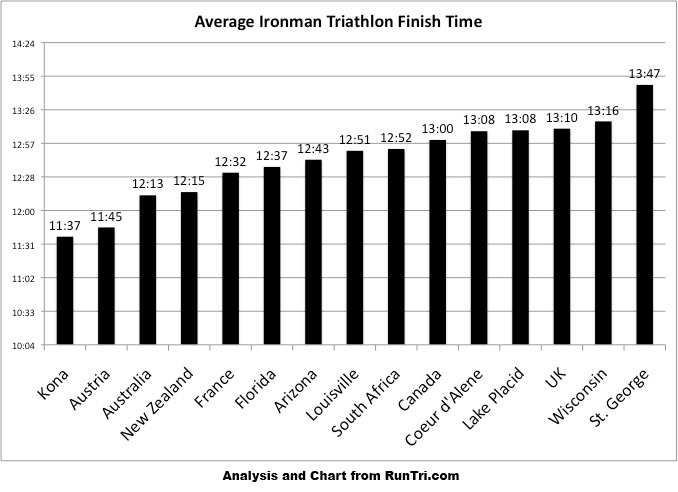 Look at the analysis of bike splits of all Ironman races across the world. I will discuss the course in detail in another post. If you are planning on doing this race, you will need to prepare. I will discuss what my strategy for the hills was and how I will approach this course in future races. This course is no joke as you can see and the high number of people who missed the cutoff affirm this. The good news is, if you train for the course, even if you are a flatlander, you can dominate. I will also discuss where your people should set up camp so they can see you a couple of times on the course. This is just another transition. I thought it was well-organized and the volunteers in the tent were fantastic. I nicely (at least as far as I remember) asked my volunteer to back off and let me manage myself. He was really cool about it and let me do my thing. The tent wasn’t well ventilated, but then again people couldn’t see inside either. I like to look at the bike as one of two evil sisters. It is the same distance as any other IM marathon, but the rolling hills are rough on your quads. After you get off of a bike that features 14,128 feet of climbing, you get to run a course with 3,615 feet of climbing. The TSS score for me was 314.1, which means it is a little easier than the bike. I think this is due to the fact that it doesn’t take as long to finish. The aid stations are frequent and well stocked, which is nice. There are very few portions of the course that are lonely, and the crowds carried me through the low spots of the run. I will also discuss the spectating strategies for your people to be able to see you at least twice on the course. Ah, the finish of Ironman Utah. You run several blocks through town where there is plenty of space for your supporters to see you cross the line and hear Mike Reilly make the announcement that, “YOU are an Ironman”. I hope this guide will help you in your day — not only in your preparation, but also in the experience of your fan club. 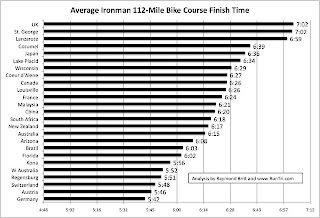 If you are just a follower of my blog and not racing Ironman St. George in 2011, I apologize in advance for this week of Ironman St. George focused posts. If you ARE racing Ironman St. George in 2011, welcome. Let me know what questions you have!